When I finished playing Shadow of the Colossus , I was impressed by it, but no more than by several other games from around the same time. Then at some point, perhaps a year and a half later, I was browsing the web and came across a picture of the game. And I gasped, I shuddered. I’d never had that sort of physical reaction to game media before; clearly the game has gotten its hooks deep into my soul, much deeper than I’d imagined. Given my current Christopher Alexander obsession, I thought I should examine the game in the light of the concepts from The Nature of Order . Shadow of the Colossus is perhaps the best example of a living structure in video games that I know of; and that structure has as its focus the beautiful, loving care with which the colossi are developed as centers. Of course, levels of scale aren’t only present in the colossi: the largest scale in the game is the entire game world (with hints at a broader world beyond it! ), and there are many, many meaningful levels of scale between that and the blades of grass. And, indeed, the game world is wonderful, and is part of what gives the game its power. 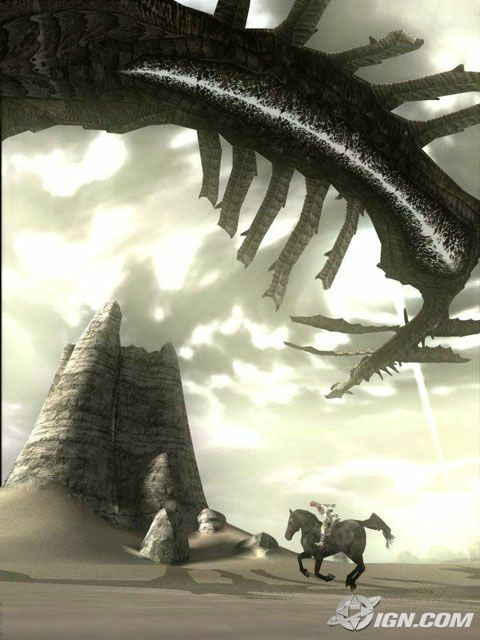 But the density of levels of scale within the colossi are one of the truly remarkable aspects of this game: in few other games will you find bosses as richly crafted as these, and in perhaps no other will you find such interplay between the visual/physical layers of scale in the bosses and the gameplay of the boss fights. The colossi are, of course, the most glorious examples here. But there are others: the protagonist, the girl, the horse. (The horse!) The central building. The birds soaring overhead. The world that you explore in the game. (Set off from the rest of the world that you can’t explore, that only exists by implication.) Your sword. The temples that dot the landscape. The ruins, the water, the crevasses, the plains, the glades. The lizards. The components that these are crafted out of, that are beautiful enough to stand on their own. And then the conceptual centers of the came: love, combat, sacredness, power, sadness. A point that Alexander emphasizes: it’s not enough that boundaries between different components exist, they have to be thick enough to stand on their own, to be centers in their own right. One example, perhaps, is the arena around each colossus. A colossus isn’t just plunked in the middle of the game world at random: it has its own territory, which is large enough to give it room to roam yet small enough that your attention is always focused on the colossus when within that area. 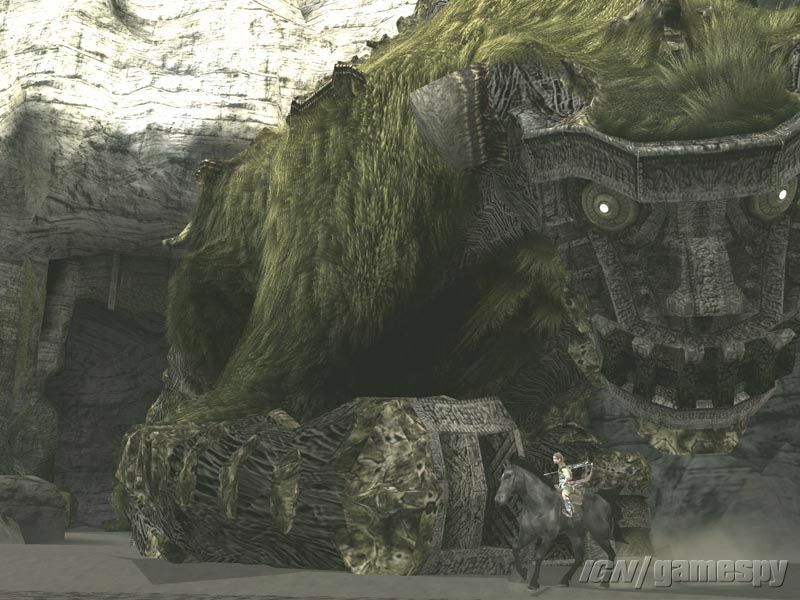 The surface of each colossus (its boundary as a three-dimensional object) is a center in its own right, and one whose thickness gives life to the gameplay of the boss fights; as are the boundaries of that surface, its feet and its face. Buildings, too, have thick boundaries: those are thick stone walls, not sheets of wood, drywall, plaster. On a larger scale, the game world is divided up into different geographies, with significant geographic barriers between them, such as the crevasses that cross the landscape. On the one hand, I’m not sure this is a property that the game goes out of its way to explore. But the simplicity of the game play in its own way brings it out very strongly nonetheless: in particular, the constant repetition of fight / travel / fight / travel, with each aspect taking a comparable amount of time, is unlike any other game I’ve ever seen. Not a property that the game goes out of its way to explore. At least I don’t think that it does: perhaps a closer look at the game map would prove me wrong, indeed perhaps the arenas you fight in could themselves best be thought of as positive space? And certainly it’s there on the colossi, e.g. the spaces between the armor that they typically wear, the spaces that so frequently form the paths that you can climb, that contain the vulnerable spots that you can stab? The colossi are full of examples of this, from the details of their bodies and armor to their overall physical layout. The designers were wise to model the colossi on animals; they were wise to pay such close attention to the real world (with its living structures), to have the architecture based on older, living models. The morality of the game is all about ambiguity, of course. But this property is one that is more interesting than you might think from its name: deep interlock is how, when adjacent centers meet, they form an area with its own power, an area that emphasizes the power of both the centers that join together there. To that end, consider the feet of the colossi. These are, in some sense, the locations where the colossi and the ground interlock; in gameplay terms, this forms a wonderfully productive region of ambiguity, in that, when this interlock exists (i.e. when the feet are on the ground, and on the ground long enough for you to take action), they transform the colossi into territory, they provide the mechanism by which you can begin ascending the colossi! The joints of the colossi (giving the interlock between upper and lower limb, or limb and torso) can provide a similar, though less powerful form of interlock and ambiguity. And then there’s the protagonist and the horse, joined together in travel and, at times, in battle. I’m not sure why the horse in this game moves me so much, but this may be part of the answer? Is this a game of strong contrasts? You versus the colossi, certainly, or areas on their bodies where you can climb and areas where you can’t. They as the forces of darkness, you with your sword of light, that seeks out the patches of light within their bodies. Or perhaps they’re the forces of light, and your sword is just the vehicle through which that’s revealed? In a lot of ways, I see more grey here than contrast. The dark of the colossus against the white of the sky, with the fins of the colossus bringing that out still more via Alternating Repetition. Indeed, the darkness that your horse shares with the colossus (is darkness the color of life in this game, or at least of nature? ), contrasted against the light of your body, of the sand. In fact, the game engine goes out of its way to artificially enhance contrasts in lighting: see this interview which, among other things, discusses how they use high dynamic range techniques. The game shines here. To be sure, “shines” is probably the wrong adjective to use when talking about roughness, but that aside: no unnatural artificial regularity to be found. The pieces of the colossi fit together in a way that just feels right: the armor is natural on their bodies, but it shows its age, it’s not freshly mass-produced out of a factory that knows nothing about the colossi, it instead fits together enough to be functional, to be properly placed, and no more. In fact, the game goes out of its way to go away from roughness, with its ruined buildings and desolate landscape. This is another relatively subtle property: the centers should have “deep internal similarities between them which tie them together to form a single unity.” ( The Phenomenon of Life , p. 218.) Which is unquestionably the case here: the colossi, despite the significant differences between their details, are unquestionably all of a piece, indeed the game has a very strong unified aesthetic. When reading the above, it may seem that I’m treating these properties as a rorschach blot that I could project onto any game. I don’t believe that to be the case: I think that this game is quite unusual in how it’s possible to find what I believe to be significant manifestations of all these properties in it. But some of those properties are present more superficially than others (typically the ones where my explanation boils down to the way the colossi look), while others are more deeply present. Part of the process of structure-preserving requires cleaning out from time to time, just as an orchard must be pruned. When a situation occurs where there are too many centers, too crowded together, in a confusion of structure, a structure-preserving process must be applied to the situation, since the conglomeration of centers becomes so confused that it begins to undermine the coherence of the centers. That means the process must act to discern the deep structure, the most important structure beneath the confusion. This important structure must then be preserved and the rest cut away. As a result, structure-preserving transformations frequently act to create The Void. As structure is preserved, the transformations act to preserve distinctness. One of the ways this happens most frequently is that dense highly differentiated structure gets set off against empty, clean smooth structure, and distinctness is maintained. We may also express this by saying that crowded complex structure often ends up living at the edge of a much larger homogeneous void, and that the contrast between the intricate structure and the vast emptiness is needed to maintain the structure of the intricacy. I don’t know what process was used to create the game, but that’s a perfect description of the result. Everything in the game is subordinate to the colossi: all extraneous design is swept away, and as a result those centers are enormously powerful. And the other secondary centers have a similar clarity arising from their pruned environments: no lush characterization (almost no characters), no complex combat mechanics, no cities to explore, not even side rooms in the main building. Very few games are brave enough to sweep away complexity in the environment like that; the resulting void gives a deep resonance to the game’s soul. There is certainly some amount of this in the overworld, but I’m not sure I can make a strong case that each colossus itself is “the simplest [configuration] consistent with its conditions.” ( Phenomenon , p. 287.) Though it’s hard to say: for one thing, you’re trying to kill them, which isn’t the best situation to bring out whatever inner calm may be inherent in their natures. And, for another thing, colossi are, well, colossal, and manifestations of something still larger, so it’s perhaps natural for them to be somewhat elaborate. A bit of a stretch, but on p. 228 of Phenomenon Alexander shows a picture of “A carved Norwegian dragon. Very complex, but it still has inner calm.” And I think some of the same applies here. The game design and mechanics are certainly close to the simplest configuration consistent with its conditions. Which brings us back to the discussion in The Void above; these two properties seem strongly linked to me. The colossi are very much part of their surroundings: each time you encounter one you feel that it’s in the most natural place where it could be, that it’s an integral part of its arena. And the arenas themselves are of a piece with their surroundings: while the arenas typically do have some framing, you don’t just turn a corner and find that suddenly you’re in a completely different area with a colossus in the middle. Instead, you travel around, feel the the suitability of the area for holding a colossus increase, and then, well, there it is. And there’s the not-separateness of you and your horse. Of you and the girl, of you and the girl and the colossi. Of the colossi from each other. I’m not sure the game manifests this property as strongly as some of the others: the presence of The Void is so strong that the strong centers in the game are somewhat isolated from each other, that they stand out in the environment. Still, there is a deep underlying connection that brings them together with each other and makes that distinctness much less jarring than it would otherwise be. I’m currently in the middle of reading The Process of Creating Life , which makes me wonder: what was the process by which these living structures were created? I can easily imagine it unfolding via the processes outlined in that book, where you start with a few centers and then transform them in a way that brings out those centers (and others that appear later), by elaborating one or another of the fundamental properties. Start, for example, with the idea of a colossus. Then, to emphasize its size, add a second, smaller figure nearby. But even nearby isn’t good enough: have that smaller figure actually crawling up the larger one, to make the size contrast as vivid as possible, to emphasize that the larger is a colossus. Gradually elaborate the colossus, drawing from real-life models but also taking care to generate a sequence of centers that provide life at the scale of the smaller center, that shape the details of the gameplay. And then generate echoes, the other fifteen colossi. Apply the same process to each of them; but what should the echoes be in deeper sense? Realize that, when creating the original boss fight, there’s a roughness, a majesty, a melancholy in the interaction; use that as the dominant aesthetic for the entire game. And, of course, we need a game world to set this in: create it in such a way that preserves that aesthetic, but that strengthens rather than weakens the colossi as centers, using the void as one of your main tools. Strong Centers and The Void: Everything in the game is designed to bring out the colossi; they have a huge impact as a result. The individual colossi as living structures: Each colossus is beautifully designed, detailed via choices that bring out Alexander’s properties and result in a wonderfully alive creature. A unified aesthetic: There’s a feeling of roughness, of age, of sadness, of wabi-sabi that pervades everything in the game.